6000 dollars for Intel 915GM Graphics driver to allow full AeroGlass and VISTA WDDM Support. Yes, the title says it all. 6000 dollars to whoever gets Aero running in a 915. I need a solution for allowing windows vista to give full WDDM rights/support for the Intel GMA 900 (Specifically the 915GM Express) mobile chipset graphics card. I think that they are too but too late, I'm not even sure if Tabletkiosk sells these UMPCs anymore. I'm sure that the i7210 is discontinued because we confirmed that news with Gail Levy, marketing manager at Tabletkiosk. Well, I just checked, Yeap, Tabletkiosk still sell the i7209. Anyway, it's a nice video review about a nice machine if you keep it running on XP. Do not try to put Vista on it because so far I have not read about anybody lucky enough to have it fully working on Vista. These machines are the only ones in the market with a Docking Station (Hey, do not start to post comments about the OQO and the UX, I'm talking about pure Origamis). 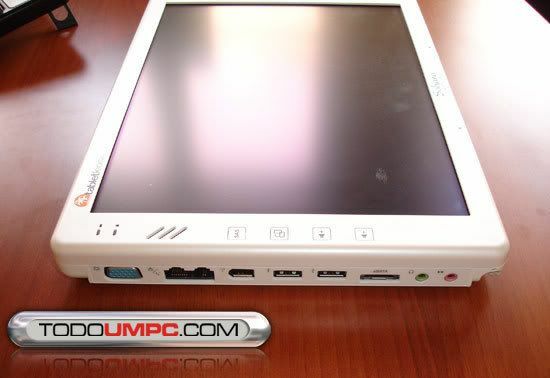 Acturion Datasys releases the new outdoor MiniTablet PC Victum-Tablet 8 according to news posted at PressBox.de. 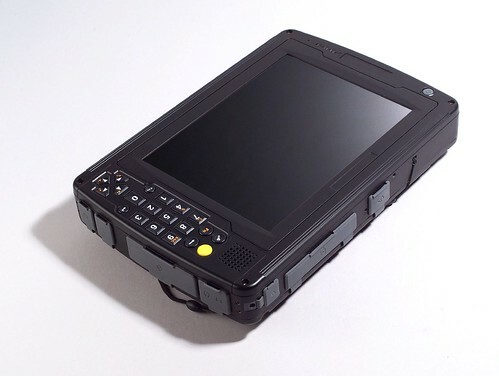 The Victum-Tablet 8 UMPC is a full ruggedized machine. The Victum-Tablet 8 UMPC is designed for use in harsh environmental conditions. 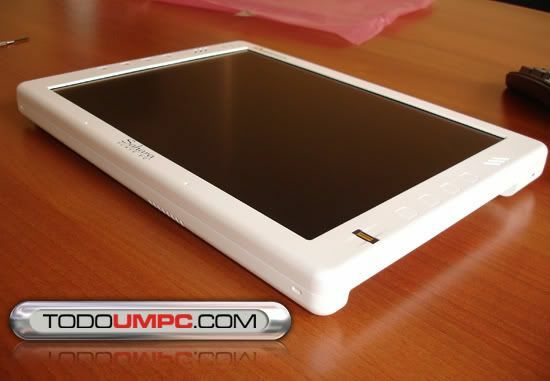 The UMPC is resistant against drop, shock, vibration, high and low temperature, rain, and dust and sand. 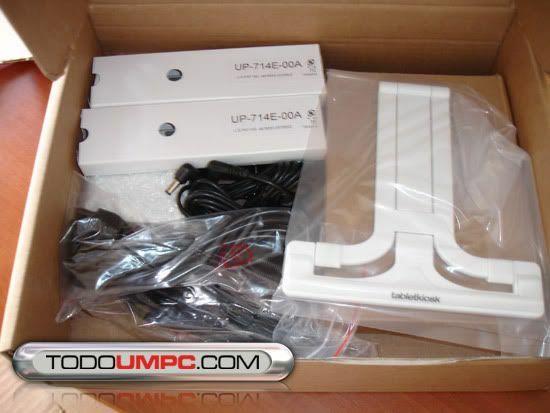 The outdoor UMPC has a completely sealed light alloy metal housing which ensures highest reliability in all situations. The housing of the Victum-Tablet 8 fulfils IP 54 (NEMA 12) and it even complies with the military standard MIL-STD 810-F. Furthermore, the UMPC complies with the International standards CE mark, FCC class B, UL and CSA. At the core of the full-ruggedized UMPC is a 1.2 GHz Intel Low-Voltage Pentium M Processor. 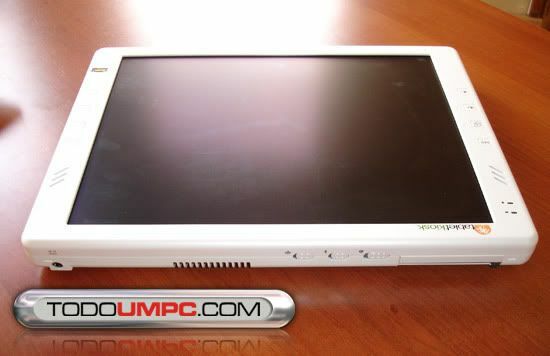 The UMPC Victum-Tablet 8 is a slate-style tablet PC without keyboard. A unique feature is the dual mode operation which means that the Victum-Tablet 8 can be operated by finger or stylus pen on the pressure sensitive touch screen or with an active digitizer pen. The operation mode can be switched manually by pressing a hard key. 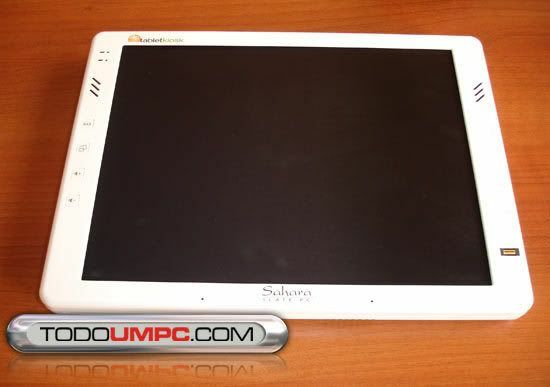 The 8.4" SVGA color TFT display has an ergonomic optimized resolution of 800 x 600 pixels. The outdoor UMPC can be ordered with a standard daylight readable display or optionally with a sunlight readable display which has an enhanced backlight. Some Vista Performance fixes on the way??? Matt at Gottabemobile is reporting about some patches leaked to the web that promise to improve Vista performance in many ways. There are a few sites reporting some Beta Hotfixes that have found their way out on the net. 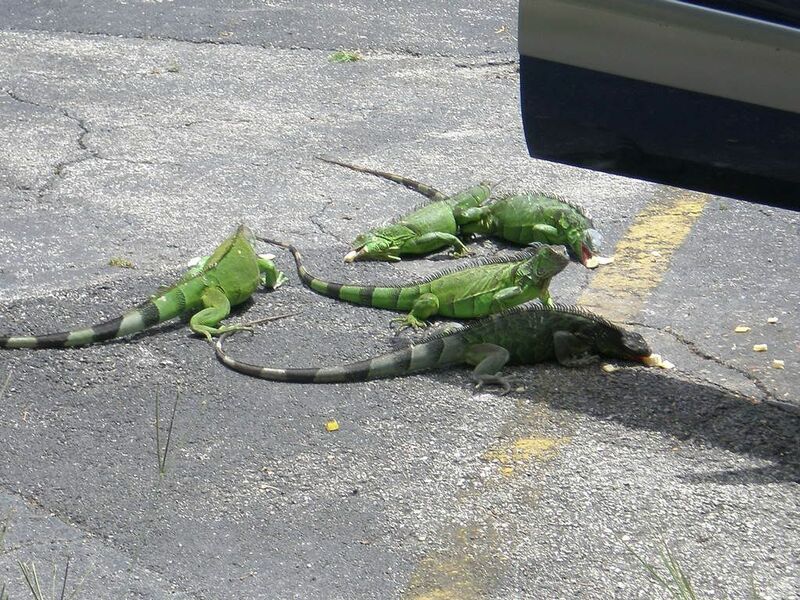 These Vista patches are supposed to enhance the performance and reliability on some issues that many have been complaining about - resuming from Hibernate or Standby and file transfers. I'm really disappointed with this device. But first let me post a fragment of Steve's review. I'm still pretty annoyed at the battery life issue but its time to put my personal feelings to one side now and do some straight reporting on the full Kohjinsha SH6 experience. I've only had it for three days but I've spent enough time with it to have an opinion on most aspects of it by now. Now, why I'm disappointed with this device? 2 hours of battery life in a device using the A110 which was supposed to sacrifice performance to gain in battery life. You already know that I need performance and this baby with that processor is just not for me. Vista Basic!!! Come on! this device has a touch screen! With Vista Basic you don't have any of the functionalities for Tablet PC. Why Vista Basic, is not because the A110 is not powerful enough for Business or Ultimate? It's running in Q1Us so I do not see why not to use it in this device. In the positive side I love the design. Like Steve says this could be a very productive device, give it more battery Life, a better performance and Vista Home Reminder or Business and this would be a perfect device. Here is a second video about this keyboard. I'm really thinking that if this keyboard is integrated in a body of a UMPC we probably are going to see many people interested on this. Just check how easy this young lady type! For instant messaging that will work very well and that's what teenagers love to do all time. After posting this note I found that it's actually for sale already here. Being a new product with a learning curve I think that they are selling it at a wrong price. It's not a UMPC but if you can live with it slow processor, this is the closest thing you can get to a UMPC, the minitabletpc WebPad TX-3000. I wonder how long takes to learn how to use this keyboard. Proof of concept - AlphaGrip technology can enable the world's fastest texting on a cell phone, smart phone or handheld computer. A new processor Code Name Isaiah with a lot better performance and higher power consumption will be released by VIA in the first Quarter of 2008. Although Isaiah's core frequency will not see any obvious increases and power consumption will be higher compared to Esther, its performance so far has been measured to be twice as fast as that delivered by the Esther architecture, and the floating point unit performance is four times greater, according to makers that are testing the new architecture. This is a long conversation between two experts of the UMPC World. Do not miss it! Chippy from UMPCPortal and JKK from jkkmobile are talking in details about UMPC products and their future. JKK and Chippy all About UMPCs- First year of UMPCs. What's next? 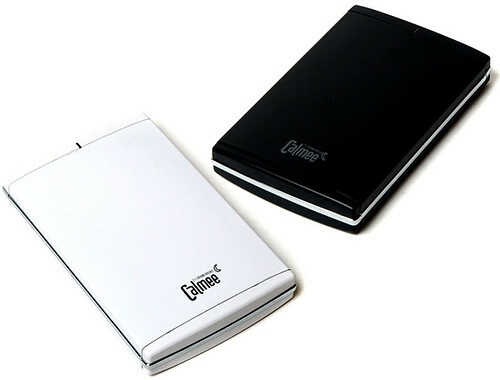 Fujitsu Korea announced the launch of its 2.5-inch 300GB external hard disk ‘Calmee Moon 300GB’ which features one touch backup function and 1.8mm-thick aluminum enclosure. this is one of the coolest software that I have seen lately. 3D Interface used in home control and automation, running in an UMPC. Check this screen shot taken from the map I posted around 24 hours ago! We have reader a far as in Alaska, China, Japan, Australia and... Greenland!!! Still nobody from Africa and Russia. The first time I heard about this tool was in Gottabemobile, this tool still a project in progress but I tested the latest version and it runs very stable. Rollup will "roll up" a windows application so that all you will see is the title bar. There's no animation yet, though i plan on adding if enough people are interested (so let me know). Here is the picture of the two of three police cars that came to our call the last Saturday. I see that you don't know too much about security so I feel that I have to explain you a few things. In order to record more frames in a HDD, the DVRs used in these security projects record a frame every few seconds and when an event or alarm is triggered they start recording at about 4 frames per second in our case. And I say in our case because the DVR that we use records up to 48 frames shared with the amount of cameras installed. In this case 12. Last Saturday the police cars are seen only in one frame. This one. Check the date and time and compare them with the ones in my video. I still have a few more frames of the police walking about the building and even entering the building from this corner. That street were you can see the police car is closed in the other end. The thieves car was parked close to the end of the street so the only way out was using that same street and the police was blocking it. Beside that, the police had already the information about the car that the thieves were using and it was not a stolen car. This facility is an old manufacturing building with a warehouse. The whole facility is for sale so it's completely empty. Thieves have been breaking in to steal any electrical thing they can, like wires, outlets, even wall ACs. The company I work for own that building and I was asked to install security cameras on it and that's how I got involved in this project. There are two things that I hate: liars and people without enough courage to leave their name when they post such kind of accusations. 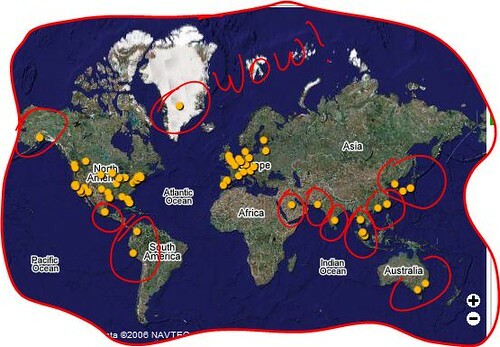 Yes, I wonder from where are people visiting this page and to know that I have prepared this map. Please, add yourself, put your mark on this map. Here is an interesting one. A Freelance programmer at OrigamiProject Forum is creating a OE clone for XP. I will try to make it close to OE as I can, though don't expect me to be able to do some graphical effects. I will also streamline the interface wherever possible. For example, if adding programs is as annoying as it was in the original Origami Program Launcher. Those who have it do not use it and those that do not have it want it desperately. - Mini keyboards are useless for Women with nails. That's covers most Women and its going to be a big challenge to consumer Internet devices. - The Everun is heavy. That's what people said. But when we probed a bit further its actually because the Everun is heavier than you expect for its size. It doesn't matter that its a quarter of the weight of a notebook PC because if the customer picks it up and its heavier than expected, its heavy! - The XP user interface is totally totally useless for a consumer Internet device. Not one person was happy to use XP. We need to learn from this. Simple interfaces are absolutely critical to the success of a device. If I had been able to demonstrate RedFlag Midinux or even Origami experience, the device would have been much more interesting to the end user. - You need always-on Internet. WiFi isn't good enough. People want instant Internet access. - Media didn't interest the people we interviewed. - Women don't think the Everun is particularly pretty. - The Everun constantly gets compared to mobile phone. Its a terrible consumer mobile phone which makes the Everun hard to promote after this first impression. All these points are really interesting and Steve is doing a wonderful job collecting them. I agree with many of these points, WiFi is not good enough, we need WiMax or whatever name they want to use in Europe for this technology. Checking these points it seems to me that Origami Experience needs to take in consideration some of these points and come with an user interface that includes an easier way to navigate on Internet and probably receive emails. In another words they probably needs to replicate the environment found in MID devices. Another point is that probably the reaction would had been another if Steve was showing Vista instead XP. If you show a new device to the public they are expecting a new software. So that reaction toward XP did not surprise me at all. is not this one the Fujitsu U1010? The Fujitsu U800 ultra-portable computer. An Amazing little piece of technology. Tablet_FnKey is an utility which allows to enable the assignation of alternative actions to the Tablet PC buttons when they are pressed in combination with a “function button” known as FnKey. 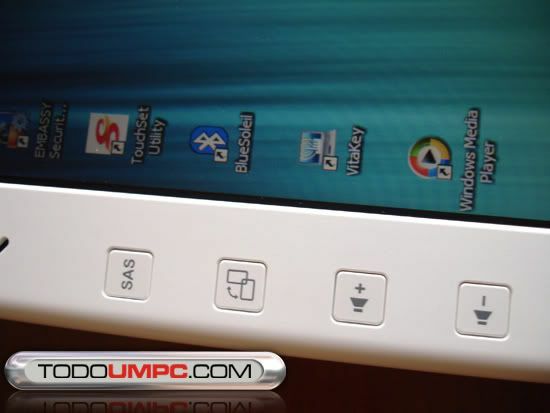 This is a feature, not always enabled, supported by all the Tablet PC and UMPC devices which uses the system’s standard method to manage the use of the buttons, but not all the devices uses such method. 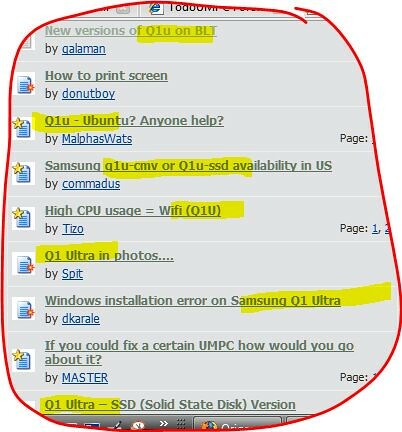 For example among the UMPC devices AMtek T700 uses this standard method while Samsung Q1 doesn’t. The utility works on Windows XP TabletPC Edition as well as on Windows Vista. You can find the link to download this application at the bottom of this post in Spanish. The application and readme files are in English. Daniel has posted a very nice article explaining why is so important to be connected the whole time. Never Disconnected - There are occasions when Email, messages, news posts, and the like are just plain urgent, but I don't want to be tethered to my computer at home. If I have to take a note, send a picture, or pass along as it happens, I am always free to do so. Never Unproductive - When I need to go out for things that take time or require waiting (car maintenance, haircuts, doctor's office) I can take all my research materials with me everywhere. I may not be able to compose a full blog post with pictures quickly on a mobile device, but I can certainly have all my notes in order to hammer it out when I get back. Save Money - This is a big one for me. As a consumer electronics nut, I spend a good deal of time in electronics stores. I hate ordering online because the look, feel, and experience of devices are very important to me and that can't be felt from a web page. Local retailers are faster in handling returns and extended warranty coverage. If I am at a store and see a new device, I can use my mobile broadband to hop online, read a review, compare it to other products, and see if the store up the street has it any cheaper. If I had a dislike CompUSA but they'll save me $40 on something over Circuit City, I can ask Circuit City if they'll price-match CompUSA and show them the price. Abandon Local Storage - To be honest, I'm tired of hard drives. I would rather have a pocketable device with 8GB or a UMPC with 32GB as a solid state device than have a 100G hard drive with me everywhere. 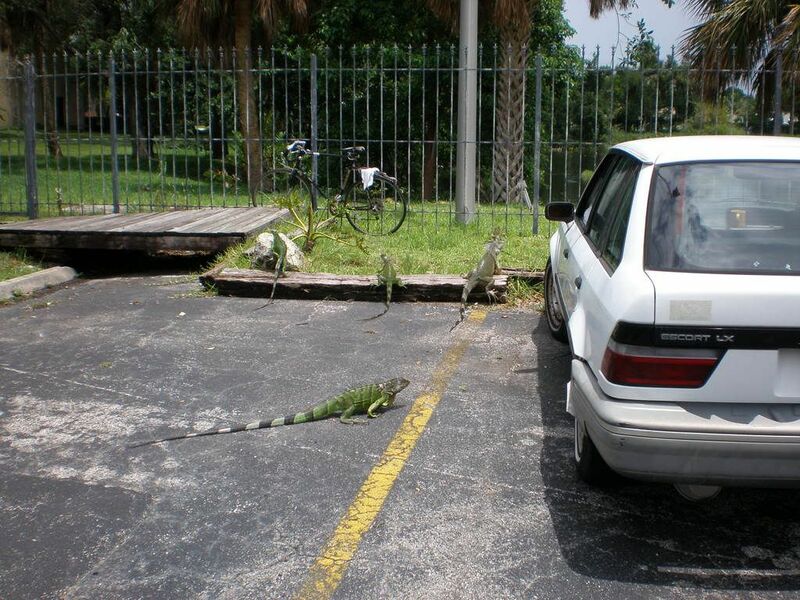 These little things can get lost, stolen, dropped, overheated, or otherwise mangled. I would rather not have a huge data loss on a system that is designed to go to more risky places where a desktop or even laptop cannot. This encourages me to use remote storage like Gmail, Google Documents, and other server-side applications. All Media, Everywhere - While we're talking about remote storage, let's talk about mobile media. With Orb, SlingBox, and related products, it is possible to have your music, movies, recorded TV, video clips, and more at your fingertips. I have 400 gigs of total media with me everywhere, thanks to Orb. Fight Boredom - Come on - everyone likes the occasional game or two. Never Get Lost - If you know in general where you are, you can quickly find out where to go. Google Maps, Windows Live Search, Mapquest, and the like often tell you where you can go based on where you are. Couple that with a Bluetooth GPS receiver and you don't even have to know where you are. Flexible Communication - With a phone, you're limited to voice and the "mobile" Internet. With a mobile broadband device, you can use voice, instant messaging, text, VOIP, video conferencing, shared whiteboards, shared documents, etc. I'd rather leave an Email than a voicemail any day. Adaptable Lifestyle - All of the above points are slight changes to the way I live my life and keep and organize my information to be more efficient. This heightened awareness of my work flow, my knowledge base, and my priorities help in ANY situation - even situations in which I do not have my technological tools handy. If I must adapt to learn a new method of life management, I am already aware of the key ways I live and can organize accordingly. Geek > Fool - It's better to be a Geek than a Fool. Really. Say you're on your way to a party but left the Emailed invitation at home: Look it up instead of calling for directions. 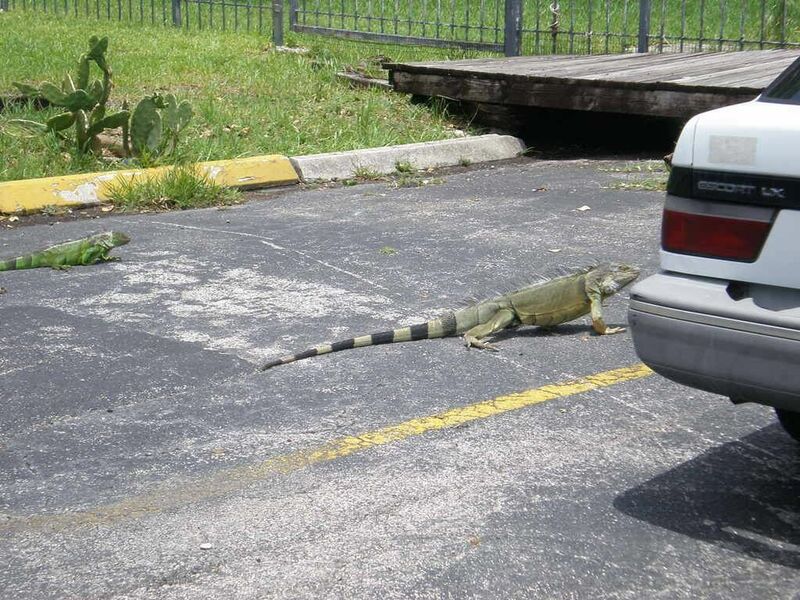 Say you're at a car dealership and the dealer is trying to wiggle extra money out of you for "required fees." Pull up evidence to the contrary. Say you're arguing with a retailer over the advertised price of merchandise. Find the ad. With hard evidence, you win. It may be a bit geeky to carry around a tiny tablet everywhere, but it doesn't take long for the awkwardness to wear off. UMPC need a world better connected to really reveal their potential. If you check the initial Origami teasing campaign all was about being connected and this is the point that they have failed to delivery. We still have very small quantities of cities where you can find the optimal connectivity environment needed for these devices. After that you need to deal with battery life and performance and all that at a lowest cost possible. The other day one of more than 1000 readers that visit this blog daily asked me how I use my UMPC. And this weekend I have prepared a short video that I believe answer his question. And perhaps, also shows why performance is so important for me. For me a UMPC is all about convenience. The convenience of having a 2 pound or less PC around me when I need it. And this video shows why. 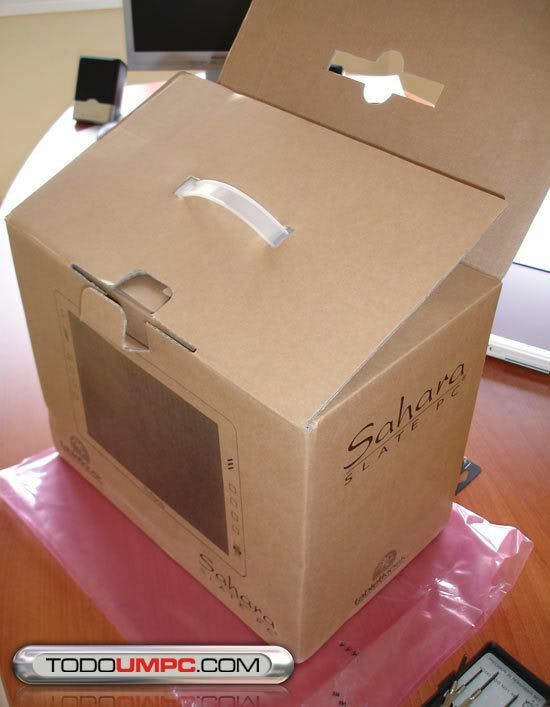 The guys from todoUMPC Online Store sent me these pictures of this beauty: The Tabletkiosk Sahara Slate. 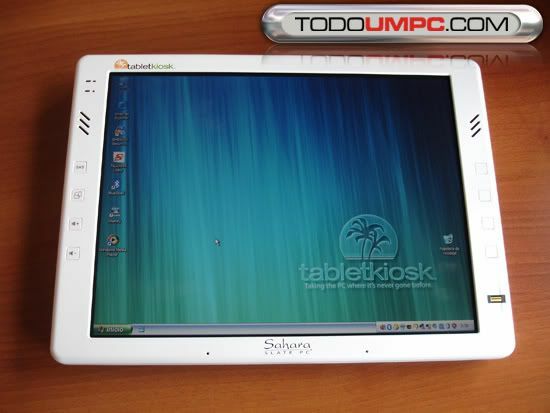 What do they think about this TabletPC? They found it fast and they loved the design. 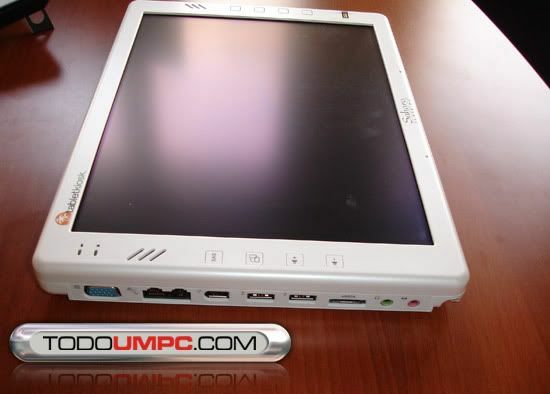 one thing, this baby is not a UMPC so be prepared to pay more than 2200 dollars. Trumpeted as the next "must have" device for the techno-savvy traveler, the Ultra Mobile PC is still being shunned by major hardware vendors and virtually ignored by users. And all this based in the words of Dell's and HP's guys who say that those two companies have better business than to dedicate a little bit of time to do a serious research about what the market wants or need. My question is, did Mr Ian hold for few minutes a UMPC in his hand? Does he know anything about UMPCs? That's the reason why this blog is about UMPC and I do not write on it anything about the moon and the stars. I write about what I know. Who is right? Either HP and Dell Australia are the smarter companies in the whole world or Samsung is the most stupid company and Sony... Sony should be at the highest level of stupidity. We should see Samsung and Sony going out of business very soon. Hugo, we need you back to put some order in Autralia. What can I say about this video? No much. This is a really good news for UMPC owners living in USA. 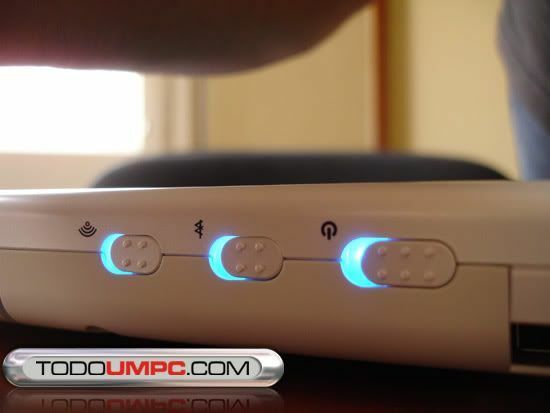 WiMax means real Internet connection every where, all time and at a high speed. 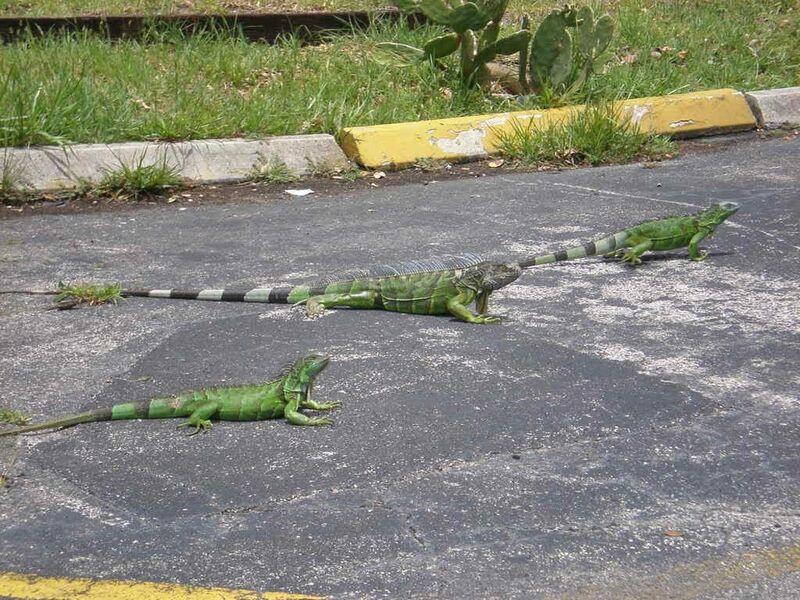 Today there are only a few cities in USA with WiMax, in Florida only two and they are very far away from me. So Bravo, Sprint and Clearwire! Sprint Nextel (NYSE: S) and Clearwire (NASDAQ: CLWR) plan to jointly construct the first nationwide mobile broadband network using WiMAX technology, and promote the global development of WiMAX-based services. I got the list from Origami Project forum that will be renamed soon to Origami Q1U Project. I think that you know why. European are lucky guys, you don't believe me? Check this TV Tuner, only 52 dollars. Here in USA you have to pay for something that it's not even close to that 100 dollars. Do you want to see this tuner in action? Here are two videos demonstrating the use of this tuner in a Sony UX. In the first one using the program that came with the tuner (which is Vista Compatible) and the second one using Media Center. Reasons to love and avoid UMPCs according to UMPCPortal. My friend Steve took the pen today and wrote his own reasons to love or avoid a UMPC. And... here is a fragment of this masterpiece. They are full PC's. UMPCs are not PDA's! They use miniaturized PC components and therefore are capable of running desktop operating systems like Windows XP, Vista or Linux. Designs are more exciting. A notebook is a notebook. A UMPC comes in many styles and designs. 4,3" pocketable up to 7" with keyboard. Sliding keyboard, folding keyboard, thumbkeyboard and even touchscreen keyboard. A UMPC is arguably more stylish and exciting than the standard notebook form-factor. They are often near-silent. Some UMPCs don't have any fans at all. They are modular. Through docking stations and accessories you can turn your UMPC into a notebook, desktop, TV/PVR, navigations device or carpc. For users that don't use productivity applications or don't input a lot of data, UMPCs can replace a notebook and allow a users to trade down from a larger smartphone to a stylish feature phone. The screen is small: an 800x480 screen size is not optimal for productivity work. newer screens have 1024x600 resolution but still, this can be limiting. They don't fit in most pockets. If Ultra-Mobile to you means 'pocketable' then I'm sorry. UMPCs are not pocketable. UMPC's are not consumer priced. UMPCs have not moved into the mass market yet and as a result, prices remain similar to high-end smartphones. UMPCs aren't available. You can't find many examples of UMPCs in your local electronics shop. Despite there being over 50 different models to choose from, they remain in the hands of specialist online resellers. Like I said before in my previous post, more than reasons why to avoid UMPCs I would call them reasons to consider before you buy a UMPC. Those reasons are the main cause of people buying and then returning a UMPC. If you consider these reasons and you can live with them, then you wont have any problem and you will enjoy your UMPC. 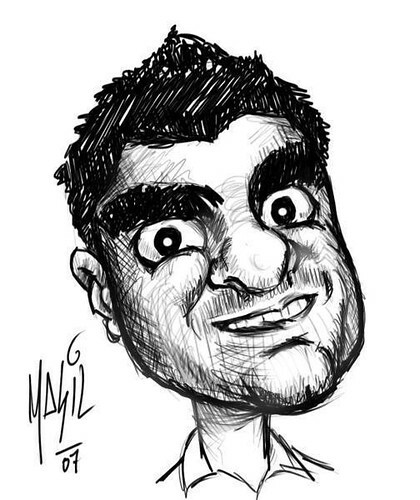 It's clear to me that the author of this article from Australian IT does not know Hugo Ortega but still, I found this article to be very interesting. For example, I think they got right the reasons why to love them while I disagree in the majority of the reasons why to avoid them. I would call those mainly, reasons to be considered for those thinking about to buy a UMPC. • They're small: Unlike many laptops, they won't weigh you down when traveling. Most tip the scales at less than a kilogram. • They're powerful: Because they're built around a grunty processor and run a fully fledged operating system, they handle most tasks you throw at them. • They're connected: With a combination of USB, ethernet, Bluetooth and Wi-Fi, you can quickly connect to just about anything in the home, office or car. • They store heaps: Equipped with up to a 60GB hard disk, the little devices swallow documents, audio and video files with ease. • They're versatile: Why carry round separate devices to play music, watch DVDs, surf the web or store your contacts when you can do all these things on one device? • They don't have a keyboard: If you need to input a lot of text or data, not having a full keyboard will soon become tiresome. • Their battery life is limited: Early models struggled to keep going for much more than an hour. This has improved, but expect to be looking for a powerpoint fairly regularly. • The screen is small: A 7in screen might be bigger than the one on your mobile phone, but it's not a lot of real estate for getting serious work done. • They don't fit in most pockets: Unless you're wearing an overcoat with large pockets, you'll have to carry the device in a bag. • Wait till they get cheaper: As the sun rises each day, so will prices of such devices eventually fall. I also find very interesting the opinions of some executives and experts from Dell and HP. Dell Australia client computing strategist Jeff Morris says his company spends a lot of time talking to customers about what they want, and UMPCs are not coming up in many conversations. "The market is clearly dictating that this is not a product they are ready for," he says. "It's what we call a tweener, sitting between a notebook and a PDA, and you have to make a lot of trade-offs in screen size and performance." Dell will watch the UMPC bracket closely, but Morris doesn't think it will take off and represent large volumes of sales anytime soon. Hewlett-Packard Australia commercial notebooks market development manager Janet Bradburn says UMPCs are a "talking point" but that's not translating into real demand for the devices. "We are still seeing it more as hype than customer demand," she says. 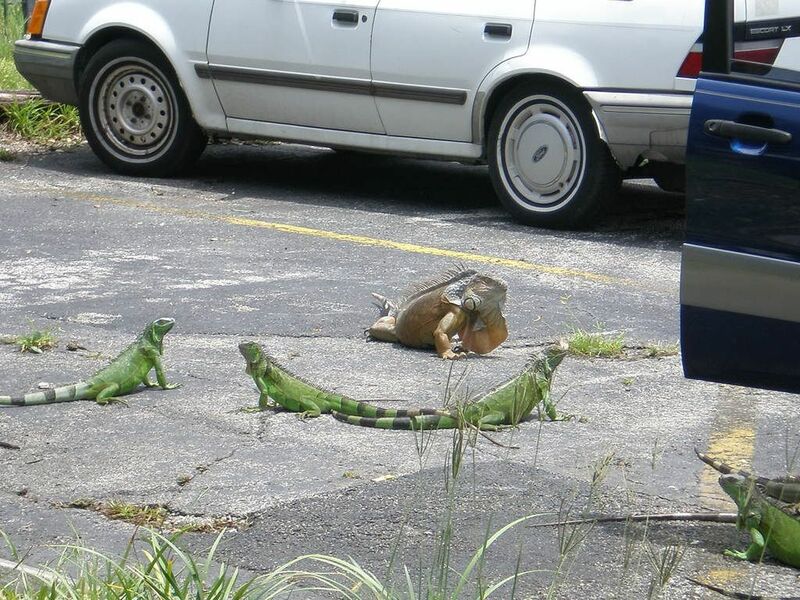 "A new shape always attracts interest but customers are still looking for something slightly larger. "Some will take up the product, but I think it will be a very low percentage." So, what about the rumor of Dell secretly making a UMPC? Well, to me is clear one thing, the market have been asking for small PCs since some time ago. If you don't believe me ask Sony. And I really think that Dell and HP are losing a great opportunity to make a lot of money. And if you don't think so, then ask Samsung. Why a company like Samsung keeps making UMPCs if there is not a market for such devices? I definitely think that Hugo should visit these guys at Australian IT and clarify them what a UMPC is and how this concept has been for a while in the market. And the most important thing, that there is a market for these devices. Don't get mi wrong. This page is about UMPCs and I'm not planning to change that. I'm just curious to find out why people are returning their iPhones. For me the iPhone is a pretty gadget with a very good looking software but... it does not do what I need. I need a cell phone that I can use as a modem to connect to my T-Mobile Data Plan. I'm using Edge at this moment and I know what means slow like hell. So, why to get a iPhone which I can't use to connect my UMPCs. Do not tell me that using the iPhone as browser will substitute my UMPC. That's a dream. I have been there. I have browsed a lot the web in many different Pocket PCs and using many different browsers and nothing compares to the real experience of doing it from your PC, Tablet, Notebook or UMPC. And on top of all this, there is the AT&T factor. I had bad experiences with AT&T in the past and I really do not want to go back. But lets read what Michael says. The iPhone was a awesome iPod. It really was. But it was a horrible smart phone. My gmail had no folder management. It also had so much trouble syncing with gmail. Sometimes I would get messages, and other times I wouldn’t. The talk volume was so low. There was no way to turn it up either. It was at the highest setting. Two years contract. I hate that. I paid AT&T 175 dollars a few months ago and I glad I did. This is a very interesting article. I recommend it. A few hours ago I walked into the Apple Store at the Stonestown Mall in San Francisco and gave back my iPhone. When the friendly salesperson asked me why I wanted to return it, I answered honestly. "I can't afford it," I said. Chippy just added a short video to his Youtube channel. UMPC running a DVB-T USB stick in a car. The UMPC is a Raon Digital Everun. The USB TV stick is the Terratec Cynergy Piranha. Update: Chippy just informed me that he published an article here to compliment the information shown on this little video. Thanks Steve. todoUMPC Magazine, the first magazine fully dedicated to UMPCs has reached its 4th issue. I know that the majority of you do not understand Spanish but from this front page you can already guess that we had a special guest in this issue: the only one... Hugo... Ortega...!!! And here is the best part, we have prepared a English translation of that Interview that can be downloaded here. I'm also publishing today for the first time in the web two pictures as evidence of the creative process behind this magazine. Hugo, did I tell you that I was preparing a surprise for you!? 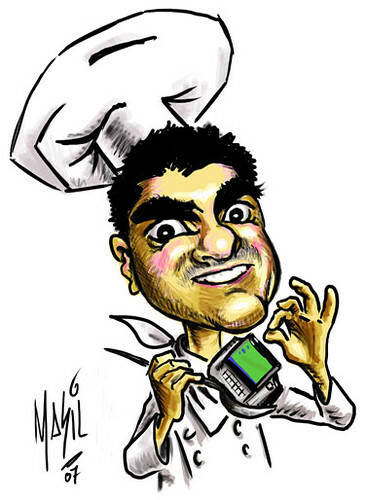 I want to thank Hugo for his time for this interview and invite all of you to download both PDF files (the Spanish Version have other very funny cartoons). 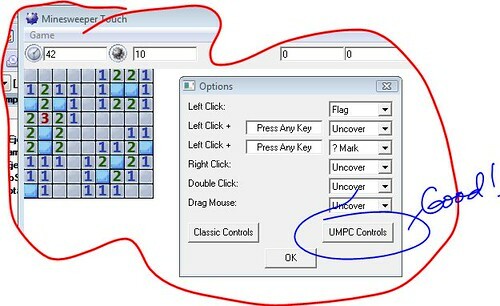 A Origami Project Member has prepared a Minesweeper version customized for UMPC. I've found playing minesweeper is impossible, as it left clicks before it right clicks, thus causing you to lose. What She is describing is typically found in devices without a real HID Driver. I suffered a lot with this issue in my Q1. Being a eo v7110 owner to me was very hard to get used to my Q1 without HID support. After installing the HID Drivers from eGalax I can hold my stylus on top of any object without triggering a left click. In this version of this game the author has fixed other issues present while playing it in a UMPC. But that was only one of the issues with Minesweeper that I fixed. My eo v7110 logon screen is calibrated! The other day I posted about a little tool that allows users to calibrate the logon screen in devices suffering of this problem. Well, today I had the time to test it myself. The Tabletkiosk v7110 is one of the UMPC that have this problem. When you turn on the device and you reach the logon screen you have to use the mouse to type your password because the touch screen is not calibrated at all. I tried in the past many tips but none of them good. Today I can say without a doubt that GlTabCal is the solution. It's very easy to use. You press the first button to calibrate your screen in any resolution. After that you press the second to test it. And at last you press the apply button. You will be asked to re boot your machine and there you will be happy to discover that your logon screen is calibrated. This tool does not work with devices using Touchkit or the eGalax HID Beta Driver. That means that basically it works in Tabletkiosk eo v7110 devices as far as I recall. I know that other devices like the Q1 XP using the HID eGalax driver have this problem, but so far there is not any solution for those. Another good news for Tabletkiosk eo v7110 owners is that a rotation screen tool is going to be released very soon. the tool was tested in Vista and it works. Today I worked with the author checking the registry in XP and according to what he saw in my eo, it seems that it should work after a few changes. The Preview Panel in Vista File Explorer is one of those hidden features of Vista that many users do not know about. Here is a short video that shows this useful functionality. The Q1U sold in Europe does not have the fingerprint reader. It has BT and WiFi. It's not clear at this point if the HDSPA is working or not. The first generation of UMPCs were more technological showcases than consumer-ready products. 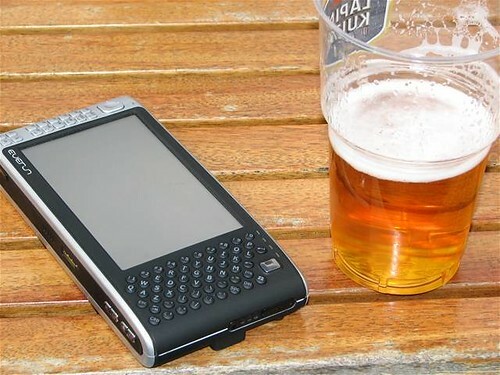 High prices and poor battery life simply did not justify replacing a full-sized ultraportable with a pint-sized device, regardless of the fact that the latter could run a full-fledged operating system. This changed when the Kohjisha SA1F00 was introduced at a very attractive price point of just over S$1,000 (US$636.04) with 5-hour battery life to boot. 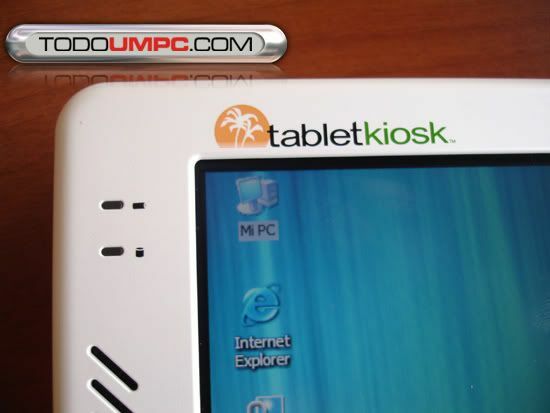 Once again, Angel Garcia, moderator at todoUMPC.com is cooking something: screen rotation for the TabletKiosk eo v7110. A sticker on the back indicated that this particular device would likely be capable of running Windows, but it doesn't seem to have the power required for all the bells and whistles of Windows Vista. Fortunately for Mandriva, this machine has all the power it needs to run Linux, including graphics, videos, and even servers if one were so inclined. The Intel MID prototype is a solid device with a few early flaws that should be resolved. Helio said that the devices derived from this prototype will likely be hitting market sometime next year, complete with a faster processor, flash memory, a card reader, and hopefully a stylus or a screen with less of a lip at the edges. Another one that finds that a A110 processor is not powerful enough for running any version of Windows. Thanks God that the devices derived from this prototype will likely be hitting market sometime next year, complete with a faster processor. I seems to me that Intel got my message! 44 MB! This was one of the biggest update I have seen in the last year. Patch Tuesday has come and gone. Eleven patches in total were released yesterday. There were three Critical patches, two patches rated Important, and a single Moderate patch. More information about theses patches can be found here. Microsoft Reader Optimized for Origami™ Is Finally Here! Hi! I'm Christine from the Microsoft Reader team. Some of you may know me from some of the other device forums like PocketPCThoughts, Aximsite or the Microsoft.Public.Reader newsgroup under the name MSReadergirl. I know that many of you have been waiting for a long time for this download and we apologize for the wait but we hope you'll think it is worth it. This new release can be downloaded here. Steve has posted his review of Everun. In May 2007, Intel told the world that they saw two markets for the UMPC. One, a higher-end market for professionals and productivity users. The other, a low-end market focused mainly on smaller, cheaper, less powerful entertainment and communication devices aimed at the consumer. This consumer market is something that Raon Digital has been focusing on since they launched their first UPMC back in August 2006 with their 4.3" screen, AMD Geode powered Vega UMPC and a year later, Raon are continuing this focus and still seem to be ahead of the game. The Everun has launched with the same small form factor and long battery life as the Vega but with some additional and unique features along with a great price. He could not have said it better, all in this device is about portability, small weight and long battery life. To talk about productivity in such small device is just a bad joke. How you are going to write efficiently in such small screen? How are you going to type at least 40 words per minute in such small keyboard? But is this small side, in fact, the main attraction that brings the Everun. 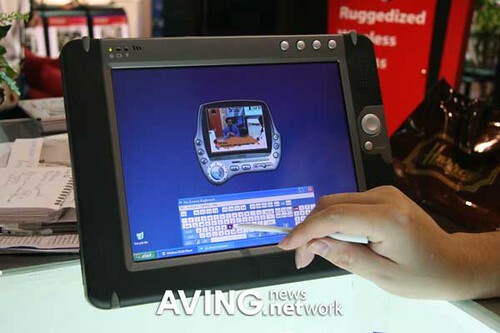 Gottabemobile found a very nice video overview of Tablet PC Features in Vista. Wow! from where that price tag came? According to an unusually brief blurb from a moderator over at TodoUMPC, "sources" have informed the site that Dell will be entering the UMPC market with a duo of devices. Unfortunately, the only "details" that were mentioned beyond that are the pricetags, which look to be €600 ($816) and €1,100 ($1496) for the two models. 'Course, we've certainly got ourselves all worked up over something similar before only to be woefully disappointed, so we're going the extra mile to keep the excitement at a minimum until Dell itself speaks on the issue. 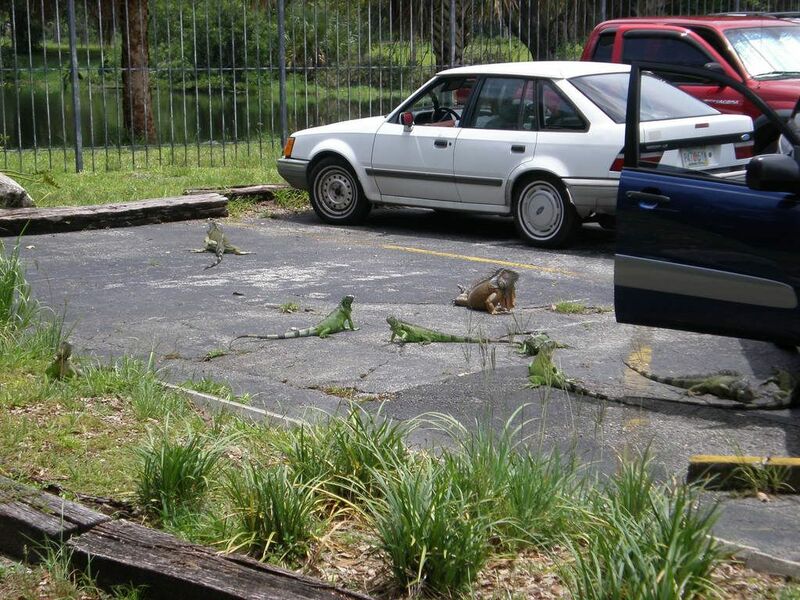 By the way, in that post at TodoUMPC, it was also mentioned the last year April 1st Photoshop joke. 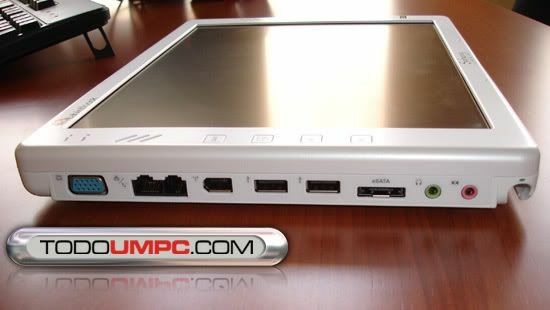 Let me repeat what was told there: Dell is planning to release a UMPC without integrated keyboard. Nothing more. No price tag, no date, no shape, no picture, no nothing. Here is the link. The same source of this rumor also informed our moderator about a year ago that Dell was not working in any UMPC, when many pages were publishing such rumor. That makes us think that this time we are in the right track. Tim Sneath as posted at his blog 50 examples of how useful could be Silverlight. I have to say that I'm impressed with some of the examples. Try the Chess game and you will see what I'm saying . Oh, to see the examples you will need Silverlight installed in your PC. Warner was right! Readyboost does not boost anything. Word started trickling out about the beta of Vista SP1 yesterday and this morning, Long Zheng posts what I hope is good news. One of the fixes in SP1 will address the horrible disk thrashing that I’ve been reporting on when you use the ReadyBoost feature. Well, the good news is that is going to be fixed. In the old town from where I'm we have a old saying, it's better late than never. I have to smile when I read that the VIA C7M is the cooler processor in the market. I really don't know how they measure the temperature but from my own experience I can't say that. In fact, I would think twice before to put that in any advertisement. One thing is for sure, the VIA C7M is a good competitor for the Intel A110. Hey VIA! Yes, I'm talking to you!I know that you read my blog (do not ask me how). What about sending me one of these to check it? is your logon screen calibrated? Sometimes the logon screen of some UMPCs and even Tablet PCs is not calibrated making very difficult to use if you do not have an integrated keyboard. Well from the todoUMPC team comes the solution! Angel Garcia member of todoUMPC team has created a tool that allows users with this problem to calibrate the logon screen in XP and Vista. GlTabCal stands for Global Tablet Calibration, after the name of TabCal utility included with the OS. GlTabCal is an utility which allows to export the user’s pen calibration to make it applicable to the computer itself, that way fixing the calibration problem sometimes noticed on the Windows logon screen that makes almost impossible to type the password by touching with the pen on the virtual keyboard. If your computer doesn’t present this calibration problem in the logon screen, then you don’t need GlTabCal. This utility was created after I discovered, researching by myself, the way to apply a global calibration for the computer, when the user haven’t logged on yet. My interest was because I owned an Amtek T700 UMPC which presented this problem. That way of fixing was published for the first time on the www.todoumpc.com users community, where it was published this utility too, in order to make things easier, saving the user from editing the Windows registry by hand, and at the same time allowing to apply the fix for Windows XP TabletPC Edition and for Windows Vista.